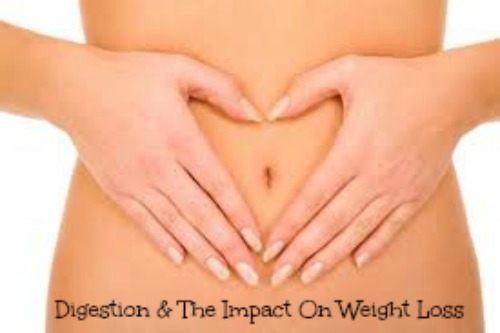 Digestion and It's Impact On Weight Loss - Welcome to SarahKesseli.com! Most people are aware that having a smooth running digestive system is important, but do you know why it is important? Are you aware of the impact that digestion has on controlling your weight? I admit that I had no idea the impact that it played for a long time. I knew that I needed to eat fiber to help “keep things moving” but I didn’t really know how important it was! If your digestive system becomes sluggish due to lack of fiber and/or water it is unable to process and dispose of the food properly. This leads to several things: 1) You begin to feel very bloated in your stomach which makes many of us believe that we are just getting fatter. 2) You become lethargic. The body is expending so much energy trying to digest the food that we have much less energy for other things such as working out and preparing healthy meals. 3) The scale goes up! You are not gaining weight (hopefully) when that number begins to increase. What you are seeing is the weight from the food that is undigested still sitting in your stomach. It’s almost like a mind game! You begin to feel fatter, you become too tired to workout and then you see the number on the scale go up! The next thing you know, you have given up on your weight loss goals because you feel defeated……just because you aren’t taking in enough fiber and drinking enough water! Who would have thought? So how much fiber should you eat? It is recommended that you take in a minimum of 25g/day to maintain healthy digestion. This number may be higher depending on your nutrition program. When we sit down to create your nutritional ‘recipe’, we will cover the amount of fiber that is right for you and your needs. Are you ready to “get things moving in the right direction”? *What are your favorite sources of fiber? *Are you taking in 25g of fiber per day? *Has digestion impacted your goals ever?